Temporary interventions, mobile artworks and project organizations or even flexible exhibition spaces without a fixed location are a growth market in contemporary art practice. Perhaps, in the present time, a nomadic existence should be considered a necessity of life and the interest in mobility a productive response to mounting institutional uncertainty. Crucial manifestations such as Parasite Paradise (Leidsche Rijn 2003) and 11ha (Stork Terrain Amsterdam 2001) explore the immense diversity of temporary constructions by artists, architects and urban planners, and show that these practices are often inextricably linked with the ambition to reach alternative target groups, to create new sites for art and to vanquish the restrictions of a rigidly regulated society. Do these ‘unregulated mobile longings’ 2 lead to a resurgence of artistic refuges and social involvement? Or is there cause for questioning this contemporary phenomenon? 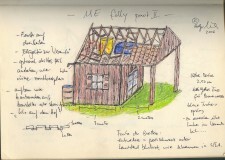 Holger Nickisch is developing the mobile unit ME/folly based on an inventory of mobile structures already created, personal experiences with art projects in public space and a consecutive series of interviews with artists involved. This concrete trial structure is offered to possible users in the cultural field as a facility, thereby forming the base of operations and knowledge centre for practical research. Specific user needs, the boundaries of public space and the strong or weak position of art part in urban renewal processes will be analyzed. 2 Tom van Gestel, Director of SKOR, Parasite Paradise catalogue, Amsterdam 2003. Holger Nikisch is a visual artist living and working in Amsterdam. In his work, he focuses on public space as a site for his work and interventions, and as inspiration source. Besides his practice as visual artist, Nikisch also curates projects nationally and internationally. 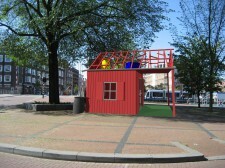 He also founded ARTWALK and in 2009 was appointed director of the artspace Kunstfort Vijfhuizen.